When embarking on a final project for my feminist theory course this semester, I decided to combine two of my passions—feminism and the Harry Potter phenomenon—and try to fuse them into a reality through social media. It turns out there are more feminist-Harry Potter nerds than I originally anticipated; my Feminist Harry Potter Tumblr quickly extended beyond my classroom and has amassed almost 100,000 views in just a few weeks! People who are unfamiliar with Harry Potter often locate feminism in the series exclusively in the guise of Hermione Granger, the most important female character in the book and arguably the most brilliant character overall. But there is much more to a feminist analysis of Harry Potter than praise of J.K. Rowling’s fictional leading lady: I have written posts that discuss the oppression of Muggle-borns, House-elves, and other magical creatures, the need for Harry to acknowledge his wealth of privilege, and the complexities of gender roles when it comes to understanding multi-faceted components of both femininity and masculinity. It wasn’t until I learned about the Hunger Is Not a Game campaign, however, that I considered my new venture a product of fan activism. The Harry Potter Alliance–a non-profit organization that encourages people to organize their activism around their Harry Potter fandom–spearheaded the campaign to coincide with the film release of The Hunger Games in order to raise awareness about global food justice. Lionsgate initially issued a takedown notice for the campaign’s name, but after an outcry of response from fans and activists on Twitter and Facebook, Lionsgate backed down and Hunger Is Not a Game continues to thrive. In 2011 and 2012 we’ve seen the power of social media–from the Arab Spring, to Occupy Wall Street and the Susan G. Komen foundation attempting to halt funding toward Planned Parenthood. The Harry Potter Alliance and Imagine Better Project extends this activist arc and demonstrates how culture and politics can be successfully combined on a social media platform. There are underlying feminist messages in the Harry Potter series, but there are also a number of problematic elements that should be analyzed through a critical lens. 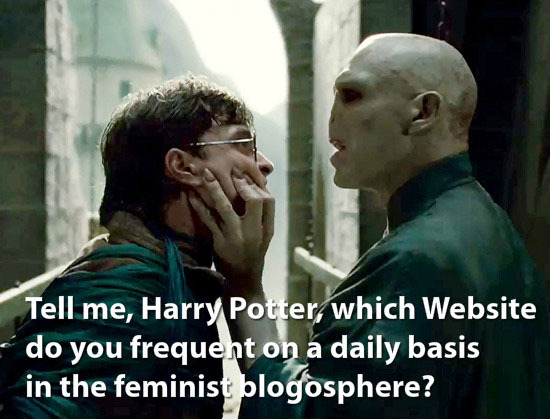 The Tumblr is not an attempt to make complete sense of all-things feminism and Harry Potter: instead of struggling to come up with my own concrete conclusions about my favorite childhood novels, I thought it would be more beneficial to open up a dialogue and start a conversation with other feminists and fans of the series in order to collectively think about different questions and possibilities regarding Harry Potter. The conversations occurring between followers in the comment section are arguably even more valuable than my individual posts because they serve as evidence that consciousness raising and analysis are taking place. It’s not just about making feminism “fun”—it’s about examining a part of pop culture that has an outsized influence in shaping our culture at large and on an individual level. Incorporating feminist theories and ideas about social change and justice into images from the Harry Potter films proved to be effective in raising awareness about both the fusion of politics and culture and the issues that I care most about. The Feminist Harry Potter Tumblr and Hunger Is Not a Game campaign are great examples of how fan activism can influence social change aided by our passions and pursuits.